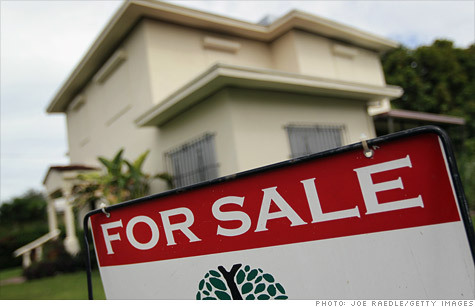 "Nine [housing markets] hit post-bubble lows," said David Blitzer, spokesman for S&P. Those nine markets include Atlanta, Charlotte, Chicago, Las Vegas and New York. The main challenge for housing continues to be foreclosures and other distressed property sales, according to Pat Newport, an analyst for IHS Global Insight. "We still have 6 million homeowners who are late on their payments," he said. "We'll still have lots of foreclosures, which will depress prices." The good news is that some of the worst hit of the index's 20 cities seem to be pulling out of their tailspins. "Some [cities], which have declined considerably over the last five to six years now have begun to exhibit an uptick in home prices," said Luis Vergara, a director with Mission Capital Advisors. Phoenix prices climbed a robust 3.3% year-over-year. Miami recorded a gain of 0.8% in the last 12 months. Even Las Vegas appears to be turning more positive, with home prices down only 8.5% year-over-year, compared with a drop of 9% in January. "While there might be pieces of good news in this report, such as some improvement in many annual rates of return, February 2012 data confirm that, broadly-speaking, home prices continued to decline in the early months of the year," said Blitzer. The weakness in Atlanta's housing market, however, deepened. Prices fell 17.3% year-over-year, which was by far the most severe decline suffered by any of the cities covered by the index. Atlanta home prices haven't been this low in 16 years. "Atlanta is still clearing out a lot of foreclosure and short-sale inventory," said Bill Boatman, president of Georgia Association of Realtors. "The price drop there is a reflection of those distressed property sales, not the normal market." Lisa Johnson of Coldwell Banker Intown noted that the housing bust hit Atlanta later than most cities. Home prices peaked in August 2007, more than a full year after national prices hit their high. "We're trailing the rest of the country in the recovery as well," she said.